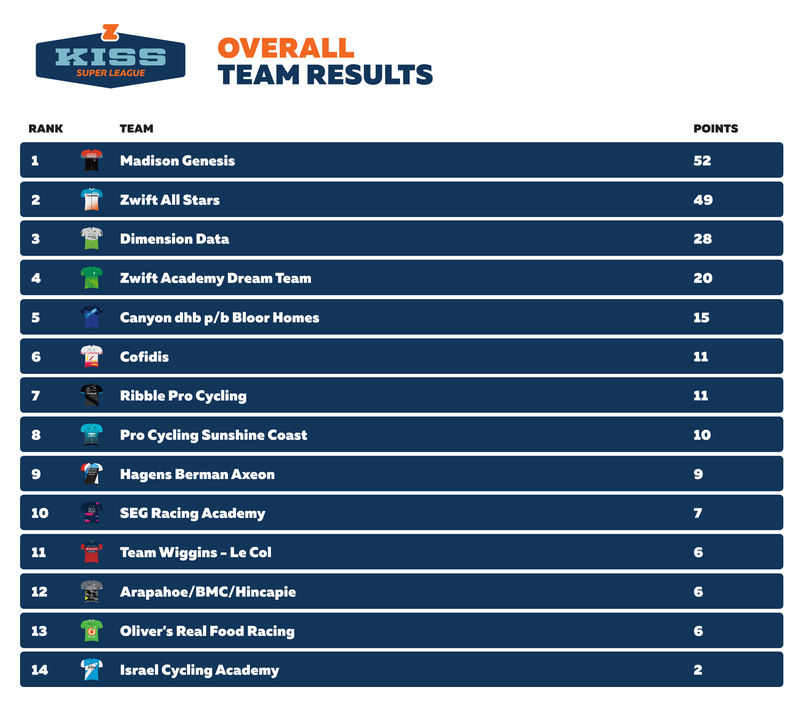 After Stage One of the KISS Super League on Wednesday, one thing was clear: if you want to win a Zwift race, it pays to spend time learning the ropes as a Zwifter. Just under 41 kilometers, this route takes racers on two laps of the Volcano Flat route on Watopia, one lap of the Volcano Climb route, finishing on top of the hill. The volcano climb is 3.7 kilometers at an average 3.2% grade, including a flat section in the middle. While the focus of the stage was that finishing climb, racers didn’t wait until then to make their moves. The race started hard and fast out of the gate, as they usually do on Zwift. Zwift All Stars team members Casey Schumm and Lionel Vujasin led it out. “If somebody slept on the starting line, they were not getting back,” Schumm said. Less than 2 kilometers in, Conor Dunne (Israel Cycling Academy), who earned "most combative rider" during the race, drove up the pace at the front of the peloton as the riders entered the underwater tunnel for the first time. The pack surged when it hit a short incline out of the tunnel, and the group started to split. More than a dozen riders lost contact with the lead group, just as they entered some dusty roads where it was hard to see. The racers also surged and split the group each time they hit a short incline into the volcano. On the second lap, Dunne powered off the front on that section, followed by a counter-attack by Pat Christopher (Zwift Academy Dream Team) with an aero helmet PowerUp. With 13 kilometers to go, Dunne tried to get away yet again in the underwater tunnel, slingshotting out of the peloton with the draft truck powerup. This time, he pulled out a gap of a few seconds. But the pack caught him as they sprinted up the ramp at the tunnel’s end. After Dunne’s strong effort, he couldn’t match the surge and was left chasing off the back. Alexandar Richardson (Canyon dhb p/b Bloor Homes) attacked soon after, but the group quickly closed it down. Coming into the final climb, the lead group was down to about 20 racers. The pace was steady but fast, shedding a few riders on the early slopes. Tom Moses (Madison Genesis) set off the attacks in the final 500 meters of the climb with a hard kick. He was chased closely by Matteo Sobrero (Team Dimension Data U23) and Mathieu Drujon (Zwift All Stars). 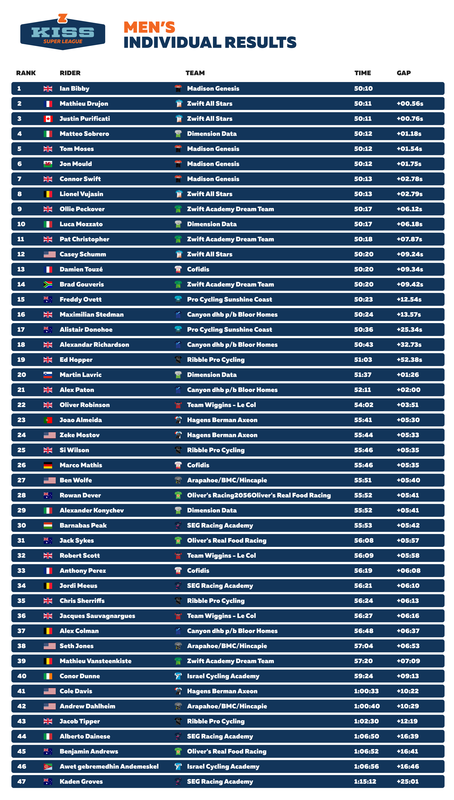 In the end, Moses’ Madison Genesis teammate Ian Bibby came from behind to win the stage in a ferocious uphill sprint. Rounding out the top five teams includes Zwift Academy Dream Team, and Canyon dhb p/b Bloor Homes. It’s no coincidence that both of them include riders that know the ins and outs of Zwift racing. “It’s the start of something huge, so to win the first event is a fantastic feeling,” Bibby said. Bibby said Madison Genesis tried to stay near the front as much as possible, so that they could react to attacks quickly. They’re in the lead in the team competition, with four of their riders finishing in the top 10. Jacque Sauvagnargues (Team Wiggins - Le Col) said he had ridden Zwift before, but hasn’t much lately, and some of his teammates were new it. His team raced side by side this week at a live event in London. Schumm, who placed 12th, said the Zwift All Stars team focused on staying in the draft most of the time. They saved their efforts for each kick up one of the familiar short ramps that could break the group apart. Next Wednesday looks like a stage for the sprinters as the riders take on the Innsbruckring course. Will the pro teams who missed out this week have a new plan? Tune in live!